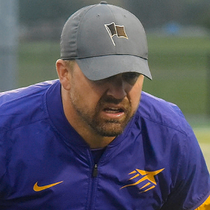 Head Coach John Puckett took the helm of the Aviators' football team in 2018. 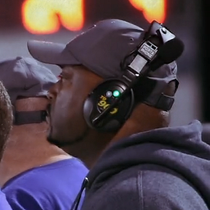 He became the only first year coach to win at least six games and secure a playoff berth in program history. Prior to Butler, Puckett coached at Centerville where he spent seven years with the Elks, serving as Defensive Coordinator for the final four years. Before that he coached high school football in Michigan, Indiana, South Carolina and Ohio. John is a 1995 graduate of Chaminade-Julienne High School where he earned seven varsity letters in football and baseball. He is a member of the Chaminade-Julienne Athletic Hall of Fame Class of 2006. After high school, he signed a football scholarship to play for Saginaw Valley State University where he was a four-year lettermen and three-year starter. He holds a Bachelor’s degree from Urbana University in Criminal Justice Leadership, and a Master’s degree from Antioch University Midwest in Education. Matt Mitchell serves as the Aviator's offensive coordinator. He specifically works with wide receivers and tight ends. 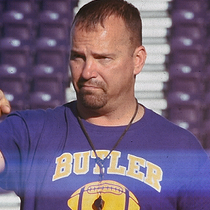 Prior to Butler, Mitchell spent 12 years coaching offensive skilled positions at Centerville under Coach Ron Ullery. Before moving back to Dayton, Ohio, he coached 3 years at Milford in Cincinnati, Ohio. Matt is a 1992 graduate of Vandalia- Butler. After graduation, he attended Thomas More College where he played football for 4 years and earned a Bachelor’s degree in Secondary Education. He has also earned a Master’s degree from the University of Dayton in Educational Leadership. Matt currently resides in Butler Township with his wife Amy and their 4 children- Jack, Maddie, Luke, and Sam. Zach Gueth has been with the Butler Football program since the 2014 season. 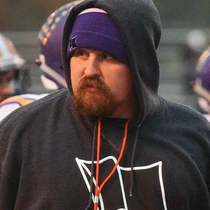 Prior to joining the Aviators, Gueth was at Arcanum-Butler High School, coaching on both the offensive and defensive side of the ball. A 2004 graduate of Vandalia Butler, Gueth continued his athletic career at Clarion University before transferring and graduating from Ohio University in 2008. Professionally Gueth is the Sport Management and Marketing instructor at Miami Valley Career Technology Center. Zach, his wife Kasey and daughter Bexley reside in the community and are proud Butler Alumni. Aubrhee Woods joined the Butler Football staff in 2017. Woods is a 2014 graduate of Princeton High School where he was a three-year starting linebacker for the Vikings. Woods went on to play a year of football at Mount Saint Joseph College. Professionally Aubrhee works as a Retail Sales Supervisor for Sprint in Springdale,Ohio. Woods is engaged and looking forward to his July wedding. 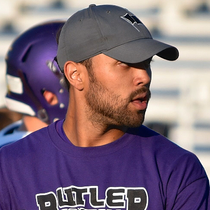 Justin Barnett joined the Butler Football staff in 2018, coaching the offensive line. Prior to his time at Butler, Barnett coached at Anderson University, serving as an Assistant Offensive Line Coach as a fifth-year senior. He would go on to coach four seasons of football in the Vandalia-Butler Junior High system and one year at Stebbins High School. Barnett is a 2007 Butler graduate where he was a two year letterman in football. After graduation he went on to play collegiately at Anderson University in Indiana, where he was a four year letterman and graduated with a Bachelor's Degree in Exercise Science. Following college Justin played four seasons of semi-pro football for the Dayton Silverbacks, Dayton Sharks, and Marion Blue Racers. He currently plays semi-pro football for Middletown's Butler County Broncos. Richard Motter joined the Butler Football staff in 2018, coaching the defensive backs. Motter is a 2013 graduate of Butler where he was a three-sport athlete and GWOC Quarterback of the Year for the Aviators. He went on to play collegiately at Carthage College in Wisconsin, playing four years as a cornerback and safety for the Reds from 2013-2017. Professionally Motter is an Educational Aide at Morton Middle School. Jerry Puckett joined the Butler Football staff in 2018. A well known name in Miami Valley football circles, Puckett began coaching at Chaminade-Julienne in 1985 as the girls softball coach, a position that he held for nine seasons. 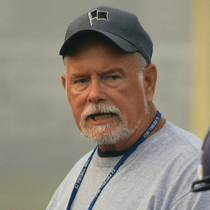 In 1989 Puckett began his football coaching career as the freshman coach. In 1991 Puckett joined the varsity staff and coached the Eagles for 28 years, coaching defense, runnings backs and kicking. During that time Puckett was part of the 2002 DII State Championship team and was inducted into both the CJ and Miami Valley Football Coaches Hall of Fame. Puckett is a 1968 graduate of Stivers High School, where he was a four-year letterman in track, three-year letterman in football and named All City in 1966. It was an athletic career that earned him induction into the Stivers Athletic Hall of Fame in 2015. After high school he went on to play two seasons collegiately at Moorehead State University. In addition to coaching at Butler, Puckett is the head coach for the Chaminade-Julienne Track team. 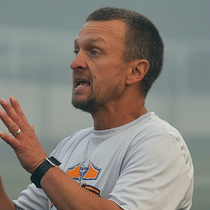 During Puckett's ten years at the helm, the Eagles have won four league titles, four district titles, two regional titles and three indoor state championships. Billy Richardson joined the Butler Football staff in 2018. Richardson graduated from Wayne High School in 1995 where he played football, basketball and ran track. After graduation, Richardson joined the Air Force and played football in a San Antonio Semi-pro league from 1997-1999. He attended the University of Dayton from 2000-2003. 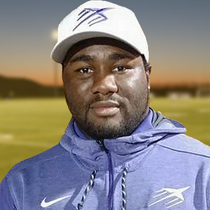 Prior to joining the Aviators, Richardson coached youth football from 2007-2008 in Washington Court House and middle school volleyball from 2013-2016 at Holy Angels School in Dayton. Professionally Billy works as a Loss Drafts Specialist at Assurant in Springfield. He and his wife Nicole have three children, (Devin 22, Ashlyn 19, Maddy 15) and one granddaughter (Ryann 2).